Companies dealing with dairy products, especially pasteurised and processed milk, have reported record profits globally over the past four years. Still, Indian dairy farmers continue to reel from low price realisation. It’s not hard to understand why. Companies buy milk at rock-bottom prices and sell at robust pre-slowdown-level rates. This could change if farmers were united to collectively bargain for better deals with dairy promoters or corporates. And there are fine role models for such enterprise. 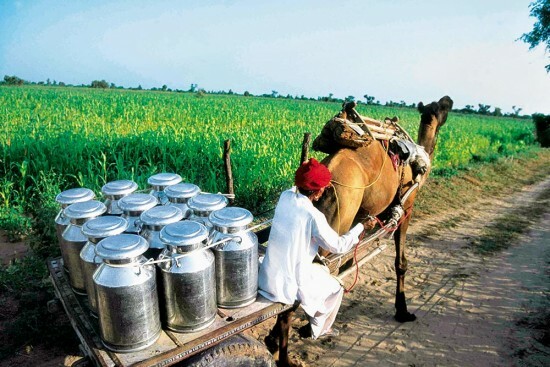 The Gujarat Co-operative Milk Marketing Federation (GCMMF), whose Amul brand is a household name, transfers around 82 per cent of its retail price share to farmers in the supply chain in Gujarat and elsewhere. That’s because Amul is a cooperative—farmers own it. Amul managing director R.S. Sodhi showcased the cooperative model that ensures handsome returns to milk farmers. Speaking at a panel discussion at the Outlook Agriculture Conclave and Swaraj Awards, organised by the Outlook Hindi magazine in New Delhi last weekend, he pushed for cooperatives as means to achieve economic empowerment for farmers. Experts and farmers at the conclave echoed similar views. This comes at a time when farm distress has become central to the political discourse, especially during the five-state assembly elections this autumn. Anger among farmers is believed to be one of the main reasons for the BJP’s loss in Rajasthan, Madhya Pradesh and Chhattisgarh in the recent assembly polls. Agriculture and farmers seem to have been left behind in India’s famed economic growth story. The outcome of the polls proved that ignoring farmers cannot be an option for any political party or government. India has become self-sufficient in a majority of agricultural products. We have set records in production of food grains, horticulture crops, dairy, fisheries, poultry and meat products. But economic well-being of farmers and good prices for their produce is still a serious problem. The government is taking initiatives and implementing schemes, but the results are not as expected. What is the solution then for all these problems? Will a loan waiver help? Or should there be a higher minimum support price (MSP) for crops? The debate pre-occupies stakeholders as well as bureaucrats and politicians. In this backdrop, Outlook Hindi took the initiative to offer a platform on which policymakers, farmers, experts and government ­representatives came ­together to ­discuss and find solutions to the crisis. The core issue is better pricing of farm produce. The theme of the conclave was the role of the cooperative sector and FPOs in empowering farmers. Agriculture economist Dr T. Haque, who is a former chairman of the Commission of Agriculture Cost and Prices (CACP), says farmers have to adopt a collective work approach through cooperatives, which will give them the power to ­bargain better for their produce and create wealth collectively to improve their economic situation. But they have to be careful since cooperatives are rife with corruption and poor leadership. The cooperative model will fail without a dedicated leadership and a transp­arent work culture—free from any ­political influence. Almost all the panellists as well as farmers attending the conclave pointed to the lacunae in the cooperative sector. Union minister for agriculture and farmer welfare Radha Mohan Singh underscored how cooperatives can be turned into well-oiled machines for the financial well-being of farmers. Delivering the event’s concluding spe­ech, the Union minister emphasised that digitisation of primary cooperative ­society records and their day-to-day functioning will increase transparency. He said the responsibility rests on the members of a cooperative society to elect an honest and capable leadership to run their collective. It is a good and proven successful model not only in the farm sector but also in other areas of economic activity such as housing and banking. Vasudha Mishra, addi­tional secretary in the ministry of agriculture and farmers welfare, said farming requires huge res­ources and mechanisation, and these are not aff­ordable for individual farmers. If farmers are united and create a coo­perative or an FPO, the ­resources will be available and shared. A member of the organisation will have a better holding capacity and will not be forced to make distress sale of his produce in a market where prices are highly volatile. He will not be at the mercy of an ‘aadhti’, or commission agent, in a mandi. A cooperative gives them the power of buying farm inputs at wholesale prices and also gives them a pricing advantage at the time of sale. On corruption and poor leadership in the sector, Mishra said, it is the ­responsibility of the cooperative members to ensure their leadership is honest as they are the ones who elect the ­office-bearers. There are rules, regulation and a ­regulatory framework in place but the onus is on the members to stop any wrongdoing. On this point, Sodhi said it is the responsibility of the far­mers and cooperative members to run the show. Farmers should adopt a farm-to-fork strategy and create an ­organisation which collects their produce, processes it and markets it. They should own and take up all ­responsibilities and look for successful examples in dairy, sugar, fishery, poultry and other agri-rel­ated areas to follow. The FPO (farmer producer org­a­nisation) is a new alternative. The gov­e­rnment has adopted a dual approach—an FPO can be created as a cooperative and also under the companies act. The ­government gives financial support through the Small Farmers’ Agri­business Consortium (SFAC) which works under the Union agriculture ministry. Many experts from the cooperative sector and the farm industry feel that it is a good model for marketing farm products. Since it is registered under the companies act, it works without government interference and gives operational free­dom to the members. But there were some fears too. Without any regulatory control it can also be a problem area for farmers. If the board is not transparent and good on making decisions, it may boomerang on the farmers, said Sodhi. Sundeep Kumar Nayak, managing director of the National Cooperative Development Corporation (NCDC), said it provides funds to coop­eratives at a reasonable rate of interest. “But our criteria is the economic viab­ility of the project. And this is the reason why our NPA (non performing assets) is near-zero. We have financed hundreds of cooperatives and some of them are here at this conclave to receive awards for their performance,” he added. There were winners in the categories of primary cooperative society, woman cooperatives run by woman, district level, state level and national co-operatives. The winners include the Rengam Cooperative Society, run by women at Majuli in Assam, and a women-run milk cooperative from Morbi, Gujarat. The Jharkhand Women Self-supporting Poultry Cooperative Federation was cited by experts as a good example of a cooperative as a successful alternative for farmers to improve their economic condition. This was the second edition of the Outlook Agriculture Conclave and Awards, an effort of the Outlook Group for a better and economically empowered farming community. A ­fin­ancially strong rural India is the key to a strong Indian economy.